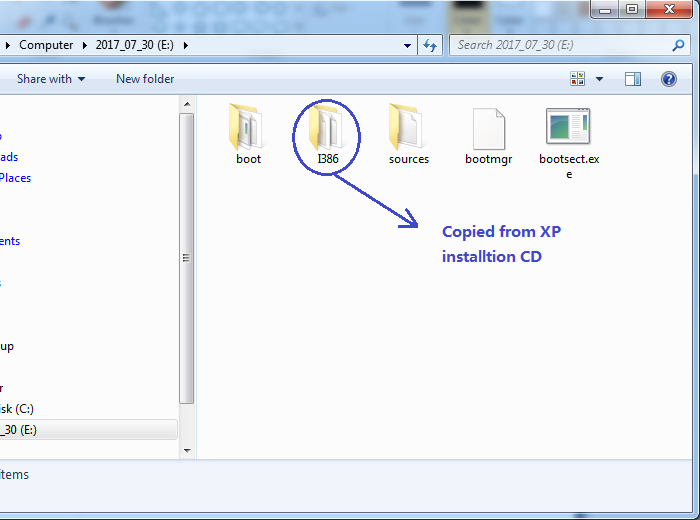 You are here: Tutorials > How to setup Windows XP from USB drive? 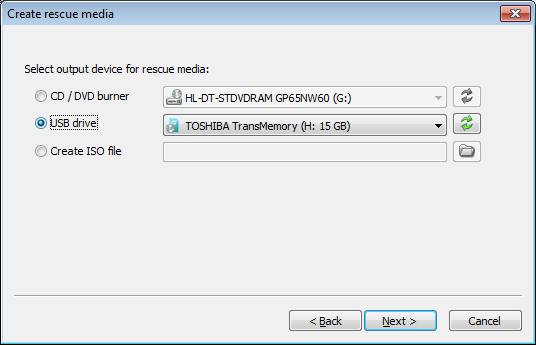 Run PowerISO rescue media utility. You can download it here. On Windows Vista or above operating system, you may need confirm the UAC dialog to continue. 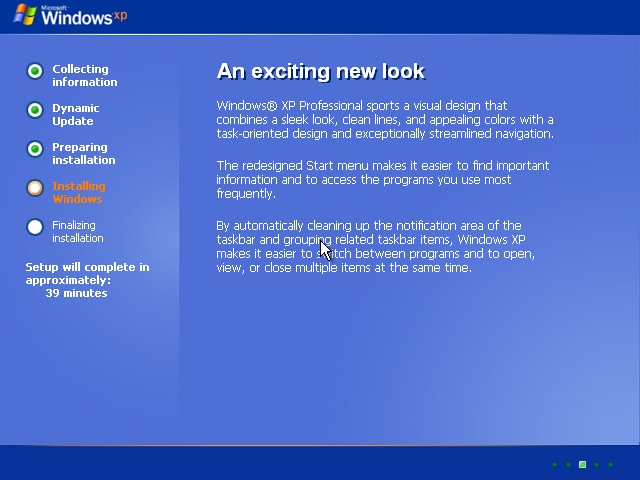 The utility will allow you choose Windows PE architecture and version. 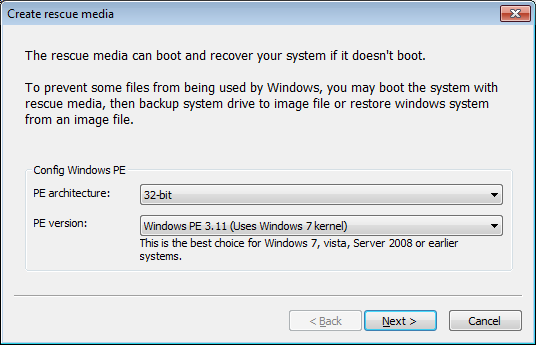 It is suggested to select 32-bit architecture and Windows PE 3.11. Click "Next" to continue. Select USB drive for output device, and select the correct drive from the list. Click "Next" to continue. The utility will start creating rescue USB drive. It will check necessary component and automatically download missing component from the server. Please notice that all existing data on the USB drive will be destroyed during this step. The program will alert you before writing the USB drive. Click "OK" to continue. Assuming that you properly configured your BIOS and your USB drive supports booting, your computer should now boot from the the rescue USB drive. Depending on the speed of your USB drive, this may take a while. You need to make sure that your hard drive is partitioned and formatted properly. Especially if you've had Linux or some other operating system on it, you'll need to repartition and format it. The rescue drive contain file manager and command line utility. You can launch DiskPart for disk partitioning and formatting from the command utility. Window XP doesn't support GPT partition. If your hard drive is partitioned in GPT mode, you also need repartition and format the disc. Click the icon on task bar to launch a command line Window. Enter DiskPart to run the built-in disk management utility. With your drive all ready, you can now launch the Windows XP setup with a few custom parameters. Let's assume that the files are available at E:\i386. Plugging in a device now won’t work. 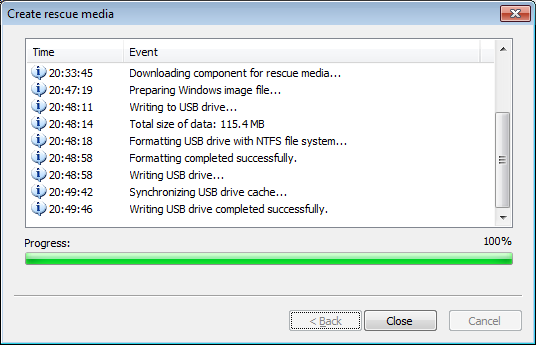 Remember that all USB devices will need to be plugged in right from the start while using the rescue drive. Run E:\i386\winnt32.exe /syspart:C: /tempdrive:C: /makelocalsource. Replace C: with the drive you want to install Windows to. Proceed with the installation. If asked to convert the installation volume to NTFS, answer No. The setup program incorrectly believes that your USB drive (if is formatted as FAT) needs conversion. Note: The above guide works with Windows XP only. For Windows 10, Windows 7, Windows 8 / 8.1, or Windows Vista operating systems, please refer to another guide at http://www.poweriso.com/tutorials/how-to-make-win7-bootable-usb-drive.htm .